"Don’t help elect Trump," yelled one heckler who was removed from the event. 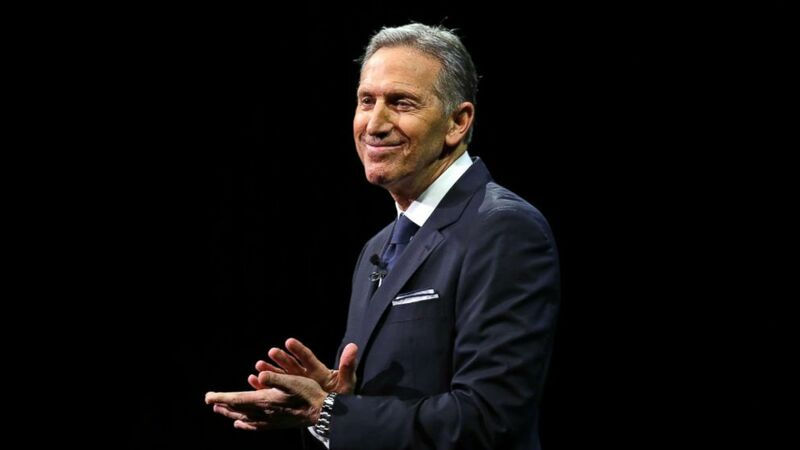 Billionaire and former CEO of Starbucks, Howard Schultz, launched his book tour in New York City on Monday, but it’s his presidential ambitions that caused a stir at the sold out event inside a Barnes & Noble. As Schultz began to speak at the event, he was interrupted by a heckler who was escorted out by security. "Don’t help elect Trump, you egotistical billionaire a--hole. Go back to getting ratioed on Twitter. Go back to Davos with the other billionaire elite who think they know how to run the world," the heckler said. A self-proclaimed lifelong Democrat, Schultz’s announcement that he is considering a run for president as an independent has caused concern from those among the Democratic Party, with some saying it may split the anti-Trump votes and help his re-election bid. On the eve of his national book tour, Schultz teased a potential presidential bid in an interview with CBS' "60 Minutes" and took a swing at President Trump, telling anchor Scott Pelley, "I am seriously thinking of running for president. I will run as a centrist independent, outside of the two-party system we're living at a most-fragile time not only the fact that this president is not qualified to be the president, but the fact that both parties are consistently not doing what's necessary on behalf of the American people and are engaged, every single day, in revenge politics." President Trump fired back at Schultz in an early morning tweet Monday. "Howard Schultz doesn’t have the "guts" to run for President! Watched him on @60Minutes last night and I agree with him that he is not the 'smartest person.' Besides, America already has that! I only hope that Starbucks is still paying me their rent in Trump Tower!" Schultz responded to the tweet, saying that he thought President Trump "has been on the wrong side of almost every issue." (Elaine Thompson/AP, FILE) Then-Starbucks CEO Howard Schultz pauses as he speaks to applaud employees at the Starbucks annual shareholders meeting, March 22, 2017, in Seattle. "I don't think we should misjudge what the president views as strength and conviction. It's really weakness. This has nothing to do with what's true and what's real. I'm not going to respond to that, it's childish and I'm not trying to win the Twitter primary,” Schultz added. Another potential presidential contender, Michael Bloomberg published a statement Monday slamming independent bids, acknowledging he once considered one as well. "Given the strong pull of partisanship and the realities of the electoral college system, there is no way an independent can win. That is truer today than ever before," Bloomberg said. "In 2020, the great likelihood is that an independent would just split the anti-Trump vote and end up re-electing the President," he added. Schultz took a moment during his event to address Bloomberg's concern, saying, "I don't agree with his conclusion." He added, "Nobody wants to see Donald Trump fired and leave office more than me. I'm in this because I love the country and I'm profoundly concerned with the direction we're in." As the negative reaction to his announcement echoed throughout social media, Schultz posted a video on Twitter defending his decision to run as an independent. "Now the word independent is just a designation on the ballot. If I run for President I will run as an American under one banner, the American flag," Schultz said. At the beginning of the event, Schultz showed a video where he doubled down on considering a run as an independent. "We are living at a time where some for whatever reason based on their own motivations their own political persuasion, want to do everything they possibly can to divide us. And I'm here to say no. We have much more in common than any of the things that divide us," Schultz said. "This is a moment in American history where I think most people believe and most people are longing for a demonstration of country over party."